The city of Jerusalem is undoubtedly one of the most important cities in the world. It serves as a focal point for the world’s three main religions, has numerous famous sites of worship, and history that goes back thousands of years. With archeologists still unveiling its many secrets, the Israeli capital has evolved to be one of the most modern and vibrant cities in the Middle East. 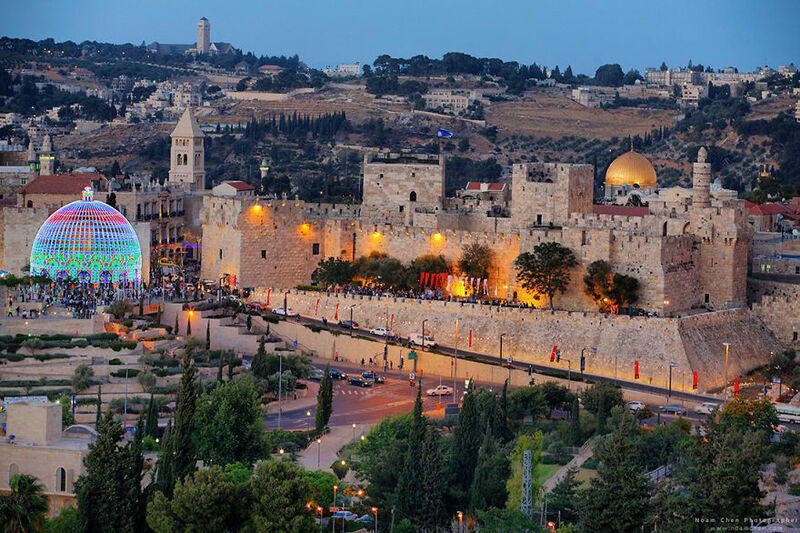 Most of you are familiar with images of Jerusalem dominated by a golden dome, surrounded by ancient walls. But this only scratches the surface of what you should see. On the mainstream media, sometimes you’ll see scenes of conflict. But here too, the reality is much different – Jerusalem is where you can witness diversity and co-existence like in no other place in the region. Having photographed the holy city for many years, I’ve had the privilege to experience it year-round and document the essence and spirituality of Jerusalem. This experience is beyond words. 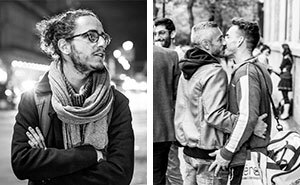 So I’m happy to present you with 24 photos that will give you a different, insider perspective on Jerusalem as you’ve never seen it before. Make sure to check all the pages, and comment below to let me know what you think! 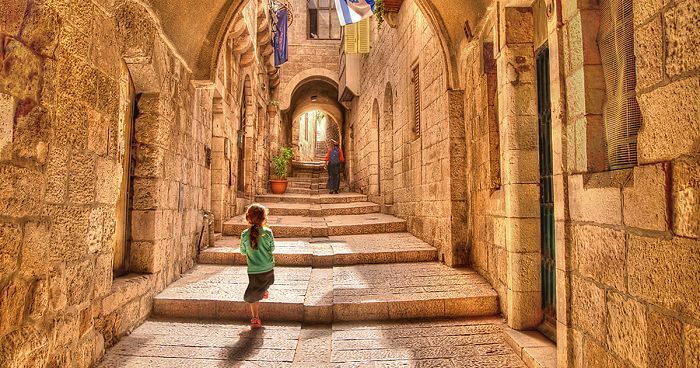 Start off by taking a stroll through the enchanting alleyways of the Jewish Quarter, where one can really feel the magic of the Old City. 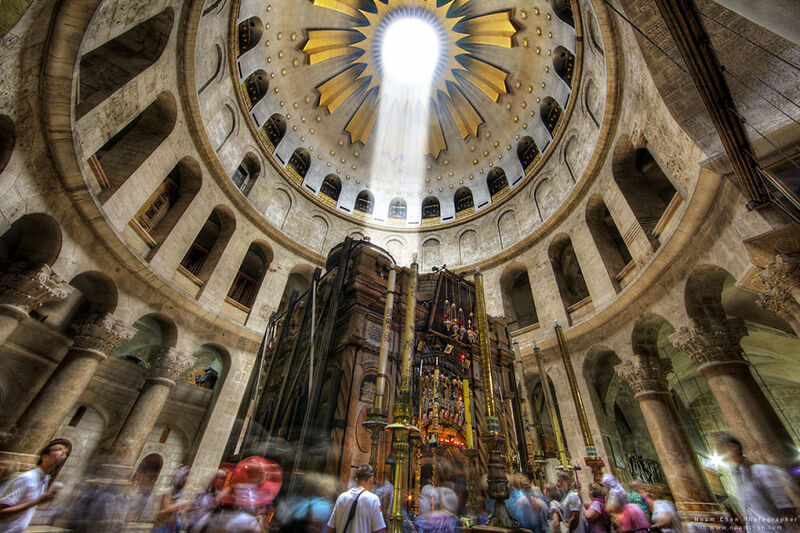 Even if you’re not religious, some things you’ll witness can seem simply divine, as this beam of light shining on Jesus’ tomb. 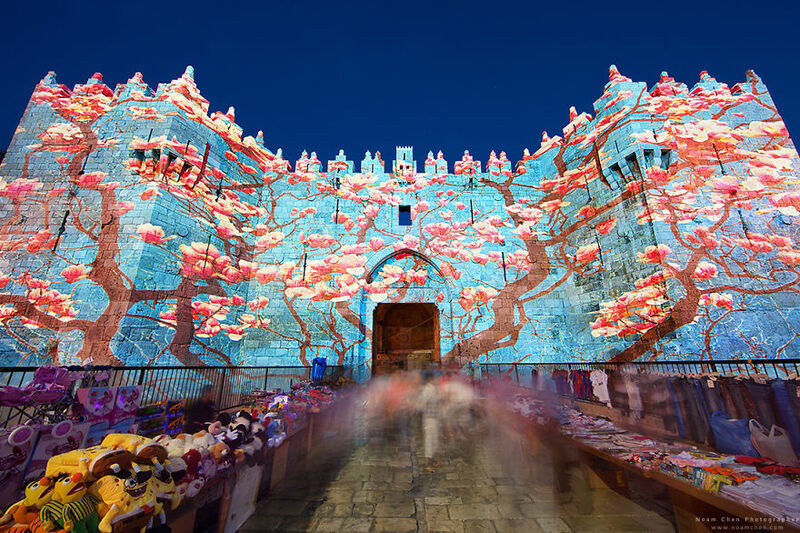 Jerusalem is an innovative city, one that fuses ancient walls with modern art, as evident during the yearly Festival of Light. The Festival is the best time to witness the balance between old and new, ancient and modern. 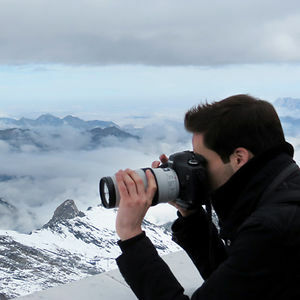 When seasons change and winter comes, the city can be mistaken for one of Europe’s capitals. Its neighborhoods wear a beautiful white blanket. The usually crowded Western Wall is left for the most dedicated of worshipers only. And when storm is over, the city’s sheer beauty is revealed again. Amazing sunsets can be enjoyed throughout the city. It could be a serene sunset overlooking Mount Zion. A glorious sunset viewed from the Mount of Olives. Or a spectacular one viewed from the mountains of Ein Karem. Jerusalem also has some stunning views you would never associate with it, such as the idyllic setting of the city’s Biblical Zoo. Or this Russian Church on top of the mountains. Jerusalem is a place to witness a fascinating history. Some sites are hidden underground, like this 5-acre (20,000 m2) cave underneath the Old City. Other sites are impressively carved in rock, like these ancient tombs dating back to the period of the Second Jewish Temple. Jerusalem is a city of a people who respect their origins, as evident at the Western Wall, the holiest site in Judaism. A city that remembers a painful past, at the renowned World Holocaust Remembrance Center, Yad Vashem. 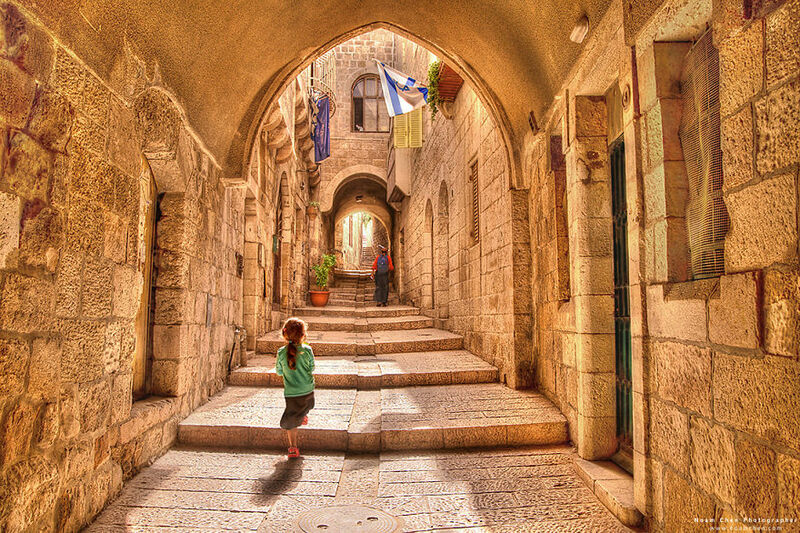 A city of the present, home to picturesque lively neighborhoods such as Yemin Moshe. And a city that gently maintains the balance between the past and the future, as in the ‘Chain of Generations’ Center. Jerusalem is also a place of many festivities, whether it’s the joyful celebrations of the city’s reunification. Or whether you’re celebrating the holidays by visiting, for example, a Christmas market in December. No matter the occasion, it will surely be a feast to the eyes! Ultimately, Jerusalem will always be a center for all religions that respect one another, as they live side by side. And it’s only when you are in Jerusalem, that you’ll finally understand why so many consider it to be the birthplace of the world. Wow! That's the first time I've ever seen pictures of Jerusalem like that! My favorite (really all of them are my favorite) was the ancient burial sites, impressive! I've always wanted to go to Jerusalem but now I really, really wanna go! Thank you so much for sharing these! They are beautiful! I'm glad you've enjoyed them Ashley, thank you! You should definitely come visit, there is still so much more to see and enjoy. I wasn't expecting anything great when I clicked on this post but wow, these are really amazing. The last picture is just wow. Perfect for close the article amazingly.